Stellar Four: In Walking Dead Monopoly, Does the Scottie Dog Token Try to Eat You? In Walking Dead Monopoly, Does the Scottie Dog Token Try to Eat You? We've done it now, people. Our love of the graphic novel-turned-hit TV show The Walking Dead has inspired a new version of Monopoly, the awkwardly named The Walking Dead Comic Survival Edition Monopoly Game. The game promises "classic Monopoly wheeling and dealing game play" in which "players vie for, and must fortify, the prime real estate and resources that will sustain their lives." Soooo ... ummm ... this sounds terrible, right? Do you compete to buy the rotted remains of Boardwalk? Do you try to squat in the burned out shells of mansions along Park Place? If you own Pennsylvania Railroad, does that mean you're allowed to sleep in its rusted, abandoned box cars? Does Community Chest become Community Weapons Chest? And what are the tokens you play with? Chainsaw? MRE packet? Shotgun? Bottle of expired antibiotics? The idea of of a zombie game isn't bad, but grafting it onto the Monopoly structure absolutely is. Monopoly is the worst, as I've stated before, because you roll and move, roll and move, for hours and hours before you inevitably bleed all of your money out to the person who snatched up the key locations in the first few trips around the board (if you haven't already quit after three hours out of sheer boredom). No amount of paying your "rent" in canned food and ammunition, or whatever the game planners have in mind, can make that set up entertaining, even in a zombie setting. The regular version of Monopoly feels like a long, slow march toward death. 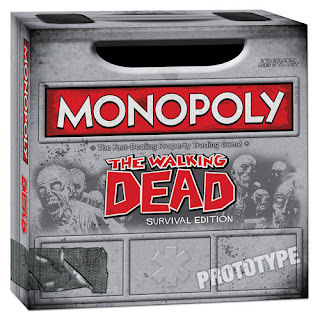 The Walking Dead Comic Survival Edition Monopoly Game just makes that long, slow march toward death literal. 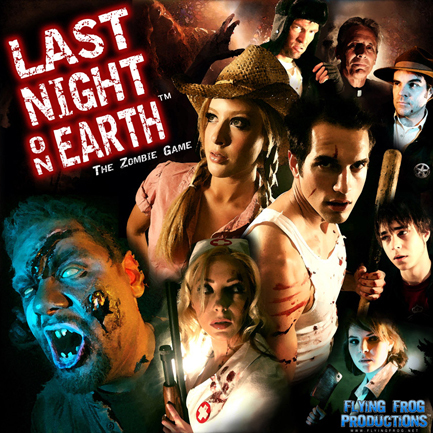 The good news is that there are some decent zombie board games out there. Check out this list on Board Game Geek, the definitive source for all things game-related, for some suggestions. I can vouch for Last Night on Earth, which allows players to choose different survival scenarios for their gameplay. You can also choose to play as a variety of human characters, or you can play as a zombie. It even comes with a CD of atmospheric spooky music. 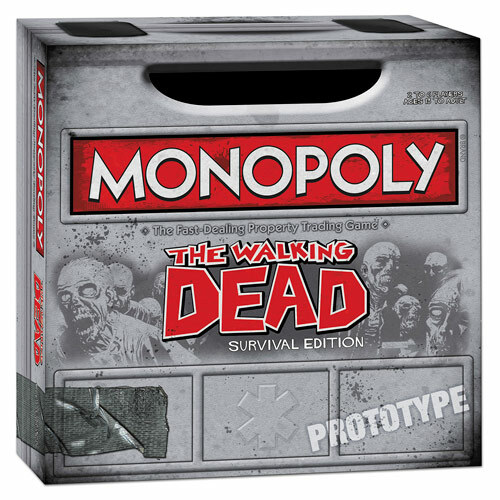 Nevertheless, if you want to pass go and collect your two gallons of siphoned gasoline, The Walking Dead Comic Survival Edition Monopoly Game is available for pre-order at the low, low price of $39.99 and is expected to ship in August.